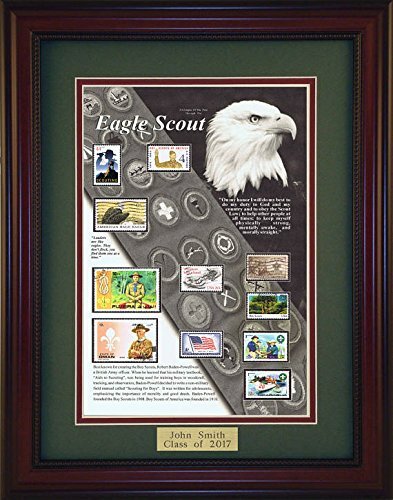 Creative Framing uses real United States Postal Service cancelled stamps and some Foreign stamps surrounded by printed words that embrace the subject and enhance the work while surrounded by a rich green and burgundy double mat. The dark cherry frame comes ready to hang for all to view in an office, den, school or nearly anywhere. A truly unique perfect gift created for the person, company or organization passionate about the story they closely relate to while appreciating quality work by dedicated American art framers. Each stamp is pulled by hand and mounted onto the print with a spray glue mount, since most stamps are cancelled no two stamps are exactly the same and the product you receive may vary slightly from the product image. Personalize this perfect and unique gift for that special occasion by adding your own message to show your thoughtfulness. Birthdays - Retirements - Graduations - Achievements - Holidays - Or just to say Thank You. Even great for your personal collection.The engraved plate has a maximum of 3 lines with 30 Characters per line. See images for more plate details. Ideal for company parties, give-aways, gifts, conferences, employee recognitions, or tokens of appreciation. Each frame describes the subject or occupation with a brief write-up and includes actual US Postal stamps related to that topic. Ready to hang, with a rich mahogany frame, double matted with a hunter green top mat and a hint of burgundy for the bottom mat. Complete with plexiglass, a dust cover for the back and protective wall bumpers. The outside of the frame measures 15 x 19. Over 600 different products available. Armed Services, Occupations, Special Interest, Events, Hobbies, Organizations, Years, and States. Look for the Creative Framing storefront on Amazon. If you have any questions about this product by American Stamp Art by Creative Framing, contact us by completing and submitting the form below. If you are looking for a specif part number, please include it with your message.